How Top Categories are generated? When you explore the Insights of a particular segment, you can discover which categories are popular among a particular segment. The Top Categories reflect the overall popularity of categories through various engagement signals such as when customers visiting category pages, when they visit product pages and when they purchase products. When a customer is viewing the product detail page of a particular product that belongs to multiple categories, Nosto counts one for all the categories associated to the product. 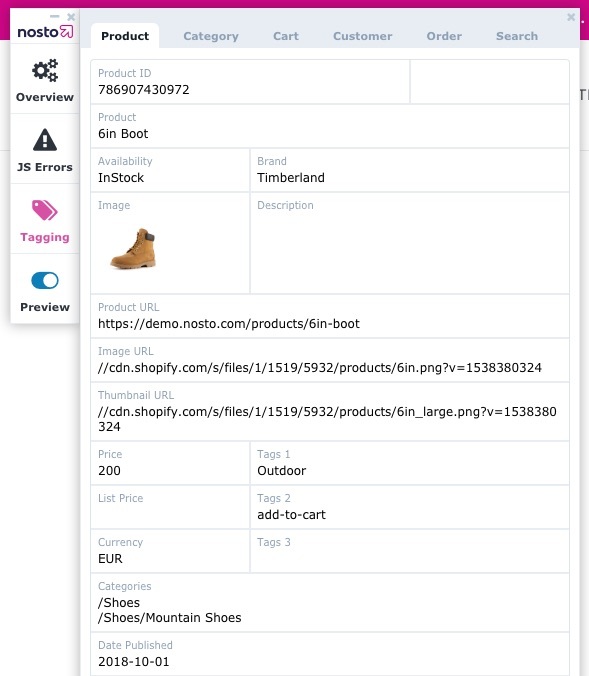 When a shopper is viewing the product detail page of this product, it counts one view for the category /Shoes and one view for the category /Shoes/Mountain Shoes. Similarly, if a shopper is buying this product, it counts one purchase for the category /Shoes and one view for the category /Shoes/Mountain Shoes.